Whitebark pine is a common component of subalpine forests and a dominant species of treeline and krummholtz habitats. It occurs in almost all major mountain ranges of western and central Montana. Populations of whitebark pine in Montana and across most of western North America have been severely impacted by past mountain pine beetle outbreaks and by the introduced pathogen, white pine blister rust. The results of which have been major declines in whitebark pine populations across large areas of its range. Additionally, negative impacts associated with encroachment and increased competition from other trees, primarily subalpine fir have occurred as a result of fire suppression in subalpine habitats. Score0 - Large: Generally >100,000 individuals. Score0 - Widespread species within Montana (occurs in 5% or more of the state or generally occurring in 6 or more sub-basins.) as well as outside of Montana. Score0 - High: Occurs in >25 Subwatersheds (6th Code HUC’s). Score1 - Moderate: Species is restricted to a specific habitat that is more widely distributed or to several restricted habitats and is typically dependent upon relatively unaltered, good-quality habitat (C Values of 5-7). CommentWhitebark Pine has declined significantly due to blister rust and mountain pine beetle attacks. Encroachment by other conifers and disruption of natural fire cycles have also contributed to the declining trends. Score3 - Very High: >70% of the populations are being negatively impacted or are likely to be negatively impacted in the near future by one or more activities or agents that are expected to result in decreased populations and/or decreasing habitat quality and/or quantity. CommentWhite Pine Blister Rust is the primary threat to the species' viability. Score2 - High Vulnerability: Very specific biological attributes, unusual life history characteristics or limited reproductive potential makes the species highly susceptible to extirpation from stochastic events or other adverse impacts to its habitat and very slow to recover. CommentLong time span to reproductive maturity. Score 9 total points scored out of a possible 19. Small tree to 25 m tall with ascending branches and a rounded or flat-topped crown. Bark smooth, light gray. Leaves yellow-green, 2–6 cm long, 5 per fascicle. Seed cones ovoid, 4–8 cm long, remaining on the tree and closed until opened and/or dislodged by squirrels or birds. Scales thin at the base but thickened toward the tip. Seeds wingless, 7–11 mm long (Lesica 2012. Manual of Montana Vascular Plants. BRIT Press. Fort Worth, TX). In MT east to Liberty and Park counties; BC and AB south to CA, NV, and WY (Lesica 2012. Manual of Montana Vascular Plants. BRIT Press. Fort Worth, TX). Subalpine and krummholtz habitats in most mountain ranges. This species has a Predicted Suitable Habitat Model available. Beetle kill and blister rust have heavily impacted some populations of Whitebark pine, including many in MT. Do you know of a citation we're missing? Arno, S. F., and T. Weaver. 1990. Whitebark pine community types and their patterns on the landscape. Pages 97-105 in: W. C. Schmidt and K. J. McDonald, compilers. Proceedings-Symposium on Whitebark Pine Ecosystems: Ecology and Management of a High-Mountain Resource. March 29-31 1989, Bozeman, MT. USDA Forest Service, Intermountain Research Station. General Technical Report INT-270. Ogden, UT. 386 pp. Ash, M., and R. J. Lasko. 1990. Postfire vegetative response in a whitebark pine community, Bob Marshall Wilderness, Montana. Pp. 360-361 in W. C. Schmidt and K. J. McDonald, comps., Proc., Symp. on whitebark pine ecosystems: ecology and management of a high-mountain resource. USDA For. Servo Gen. Tech. Rep. INT-270. 376 pp. Chew, J. D. 1990. Timber management and target stands in the whitebark pine zone. Pp. 310-314 in W. C. Schmidt and K. J. McDonald, comps., Proc., Symp. on whitebark pine ecosystems: ecology and management of a high-mountain resource. USDA For. Servo Gen. Tech. Rep. INT-270. 376 pp. Despain, D. G. 1990. High-mountain resources of National Park Service lands. P. 53 in W. C. Schmidt and K. J. McDonald, comps., Proc., Symp. on whitebark pine ecosystclllS: ecology and management of a high-mountain resource. USDA For. Servo Gcn. Tech. Rep. INT270. 366 pp. Despain, D. G., and R. G. Krebill. 1990. 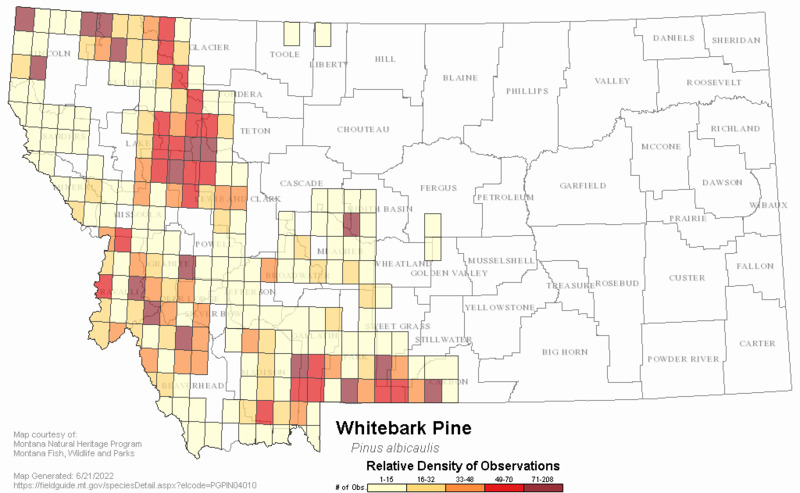 Information gaps and research needs for whitebark pine. Pp. 349-351 in W. C. Schmidt and K. J. McDonald, comps., Proc., Symp. on whitebark pine ecosystems: ecology and management of a high-mountain resource. USDA For. Servo Gen. Tech. Rep. INT-270. 376 pp. Forcella, F. 1977. Flora, chorology, biomass and productivity of the Pinus albicaulis-Vaccinium scoparium association. M.S. thesis. Montana State University, Bozeman. 99 pp. Forcella, F., and T. Weaver. 1979. Food production in the Pinus albicaulis/Vaccinium scoparium association. Montana Acad. Sci. Proc. 39:73-80. Hansen-Bristow, K., C. Montagne, and G. Schmid. 1990. Geology, geomorphology, and soils within whitebark pine ecosystems. Pp. 62-71 in W. C. Schmidt and K. J. McDonald, comps., Proc., Symp. on whitebark pine ecosystems: ecology and management of a high-mountain resource. USDA For. Servo Gen. Tech. Rep. INT270. 366 pp. Hoff, R., and S. Hagle. 1990. Diseases of whitebark pine with special emphasis on white pine blister rust. Pp. 179-190 in W. C. Schmidt and K. J. McDonald, comps., Proc., Symp. on whitebark pine ecosystems: ecology and management of a high-mountain resource. USDA For. Serv. Gen. Tech. Rep. INT-270. 376 pp. Jacobs, J. 1989. Temperature and light effects on seedling performance of Pinus albicaulis. M.S. thesis, Montana State University, Bozeman. 39 pp. Keane, R. R., S. F. Arno, J. K. Brown, and D. F. Tomback. 1990. Simulating disturbances and conifer succession in whitebark pine forests. Pp. 274-288 in W. C. Schmidt and K. J. McDonald, comps., Proc., Symp. on whitebark pine ecosystems: ecology and management of a high-mountain resource. USDA For. Serv. Gen. Tech. Rep. tNT-270. 376 pp. Keane, Robert E.; Tomback, D.F. ; Aubry, C.A. ; Bower, A.D.; Campbell, E.M.; Cripps, C.L. ; Jenkins, M.B. ; Mahalovich, M.F. ; Manning, M.; McKinney, S.T. ; Murray, M.P. ; Perkins, D.L. ; Reinhart, D.P. ; Ryan, C.; Schoettle, A.W. ; Smith, C.M. 2012. A range-wide restoration strategy for whitebark pine (Pinus albicaulis). Gen. Tech. Rep. RMRS-GTR-279. Fort Collins, CO: U.S. Department of Agriculture, Forest Service, Rocky Mountain Research Station. 108 p.
Kendall, K. C. and S. F. Arno. 1990. Whitebark pine-an important but endangered wildlife resource. Proceedings-symposium on whitebark pine ecosystems: ecology and management ofhigh-mountain resource, 1989 March 29-30, Bozeman, MT. Gen. Tech. Rep. INT-270, Ogden, UT, US Department of Agriculture, Forest Service, Intermountain Research Station. Pp.264-274. Kracht, R. L., and W. W. McCaughey. 1990. Artificial reforestation of whitebark pine. Pp. 369-370 in W. C. Schmidt and K. J. McDonald, comps., Proc., Symp. on whitebark pine ecosystems: ecology and management of a high-mountain resource. USDA For. Serve Gen. Tech. Rep. INT270. 376 pp. Lasko, R. J. 1990. Fire behavior characteristics and management implications in whitebark pine ecosystems. Pp. 319-323 in W. C. Schmidt and K. J. McDonald, comps., Proc., Symp. on whitebark pine ecosystems: ecology and management of a high-mountain resource. USDA For. Serv. Gen. Tech. Rep. INT-270. 376 pp. Lesica, P., M.T. Lavin, and P.F. Stickney. 2012. Manual of Montana Vascular Plants. Fort Worth, TX: BRIT Press. viii + 771 p.
Little, E.L., Jr. 1979. Checklist of United States trees (native and naturalized). Agriculture Handbook No. 541. U.S. Forest Service, Washington, D.C. 375 pp. Lonner, T. N., and D. F. Pac. 1990. Elk and mule deer use of whitebark pine forests in southwestern Montana: an ecological perspective. Pp. 237-244 in Proc. of Symposium on whitebark pine ecosystems: ecology and management of a highmountain resource. USDA For. Serv., Intermount. Res. Sta. Gen. Tech. Rep. INT. 270. 386 pp. Losensky, B. J. 1990. Historical uses of whitebark pine. Pp. 191-197 in W. C. Schmidt and K. J. McDonald, comps., Proc., Symp. on whitebark pine ecosystems: ecology and management of a high-mountain resource. USDA For. Serv. Gen. Tech. Rep. INT-270. 376 pp. Martinka, C. J. 1990. Integrating whitebark pine into national park management goals. Pp. 341-343 in W. C. Schmidt and K. J. McDonald, conlps., Proc., SyJnp. on whitebark pine ecosystems: ocology and management of a high-mountain resource. USDA For. Serve Gen. Tech. Rep. INT-270. 376 pp. Mattson, D. J., and D. P. Reinhart. 1990. Whitebark pine on the Mount Washburn massif, Yellowstone National Park. Pp. 106-117 in W. C. Schmidt and K. J. McDonald, comps., Proc., Symp. on whitebark pine ecosystems: ecology and management of a high-mountain resource. USDA For. Serve Gen. Tech. Rep. INT270. 376 pp. Mattson, D. J., D. P. Reinhart, and B. M. Blanchard. 1992. Variation in production and bear use of whitebark pine seeds in the Yellowstone area. In Proc., Plants and their environment: first biennial scientific conference on the Greater Yellowstone Ecosystem:in press. Mattson, D. J., K. C. Kendall, and D. P. Reinhart. 2001. Whitebark pine, grizzly bears, and red squirrels. Pp. 121-136 In Whitebark Pine communities, ecology and restoration (D. F. Tomback, S. F. Arno, and R. E. Keane, eds.). Island Press, Washington, D.C. 440 pp. Mattson, D.J., B.M. Blanchard, and R.R. Knight. 1992. Yellowstone grizzly bear mortality, human habituation, and whitebark pine seed crops. Journal of Wildlife Management 56 (3) :432-442. McCaughey, W. 1990. Biotic and microsite factors affecting Pinus albicaulis establishment and survival. M.S. thesis, Montana State University, Bozeman. 78 pp. McCaughey, W. W., and W. C. Schmidt. 1990. Autecology of whitebark pine. Pp. 85-96 in W. C. Schmidt and K. J. McDonald, comps., Proc., Symp. on whitebark pine ecosystems: ecology and management of a high-mountain resource. USDA For. Serve Gen. Tech. Rep. INT270.376 pp. McCaughey, W., and T. Weaver. 1990. Bibliography of whitebark pine. Pinus albicaulis engelm. Pp. 376-386 in W. Schmidt and K. McDonald, eds., Symposium on whitebark pine ecosystems: ecology and management of a high mountain resource. USDA For. Serve Gen. Tech. Rep. INT-270. McCaughey, W., and T. Weaver. 1990. Biotic and microsite factors affecting whitebark pine establishment. Pp. 140-150 in W. Schmidt and K. McDonald, eds., Symposium on whitebark pine ecosystems: ecology and management of a high mountain resource. USDA For. Serve Gen. Tech. Rep. INT-270. Schmidt, W. C., and K. J. McDonald, compilers. 1990. Proceedings-Symposium on whitebark pine ecosystems: Ecology and management of a high-mountain resource. March 29-31 1989, Bozeman, MT. USDA Forest Service General Technical Report INT-270. Intermountain Research Station, Ogden, UT. 386 pp. Weaver, T. 1990. Seeing whitebark pine in a northern Rocky Mountain (USA) landscape: notes for a field trip. Pp. 355-358 in W. C. Schmidt and K. J. McDonald, comps., Symp. on whitebark pine ecosystems: ecology and management of a high mountain resource. USDA For. Serv. Gen. Tech. Rep. INT-270. 376 pp. Weaver, T. and D. Dale. 1974. Pinus albicaulis in central Montana: environment, vegetation and production. American Midland Naturalist 92:222-230. Weaver, T. and F. Forcella. 1986. Cone production in Pinus albicaulis forests. Pages 68-76 in: Shearer, R. (ed). 1986. conifer tree seed in the inland mountain west - Symposium proceedings. USDA Gen Tech Rep Int 203. Ogden, Utah 285 pp. Weaver, T., and D. Dale. 1990. Effects of trampling on the understories of whitebark pine forests. P. 375 in W. C. Schmidt and K. J. McDonald, comps., Proc., Symp. on whitebark pine ecosystems: ecology and management of a high-mountain resource. USDA For. Serve Gen. Tech. Rep. INT270. 376 pp. Weaver, T., and J. Jacobs. 1990. Occurrence of multiple stems in whitebark pine. Pp. 156-159 in W. C. Schmidt and K. J. McDonald, comps., Symp. on whitebark pine ecosystems: ecology and management of a high mountain resource. USDA For. Servo Gen. Tech. Rep. INT-270. 376 pp. Weaver, T., F. Forcella, and D. Dale. 1990. Stand development in whitebark pine woodlands. Pp. 151-155 in W. C. Schmidt and K. J. McDonald, comps., Symp. on whitebark pine ecosystems: ecology and management of a high mountain resource. USDA For. Servo Gen. Tech. Rep. INT270. 376 pp. Weaver, T., J. Lichthardt, and D. Gustafson. 1990. Exotic invasion of timberline vegetation, northern Rocky Mountains, USA. Pp. 208-213 in W. C. Schmidt and K. J. McDonald, comps., Symp. on whitebark pine ecosystems: ecology and management of a high mountain resource. USDA For. Servo Gen. Tech. Rep. INT-270. 376 pp. Weaver, T., K. Kendall, and F. Forcella. 1990. Berry production in three whitebark pine forest types. Pp. 198-200 in W. Schmidt and K. McDonald, eds., Symposium on whitebark pine ecosystems: ecology and management of a high mountain resource. USDA For. Servo Gen. Tech. Rep. INT-270. Willard, E.E. 1990. Use and impact of domestic livestock in whitebark pine forests. Pp. 201-207 in W. C. Schmidt and K. J. McDonald, comps., Proc., Symp. on whitebark pine ecosystems: ecology and management of a high-mountain resource. USDA For. Serve Gen. Tech. Rep. INT270. 376 pp. Web Search Engines for Articles on "Whitebark Pine"
Look for this PDF icon at the top of each page as you search and browse. You can download select species by searching or when you're on a Taxa page like Class, Order, and Family. Here's some links if you want to download a whole group.